So, I had so many ideas for this last bento of Suess week but Kidlet wanted Green Eggs and Ham since that is what they are serving at school today. I did not dye the ham green because that seemed excessive. Kidlet was very happy about his green eggs! Kidlet has soy ham on skewers, green deviled eggs, mini toasts, checkered apple, strawberries, and orange bell pepper. I'm participating in a Blog Hop today in honor of Dr.Suess' Birthday!! 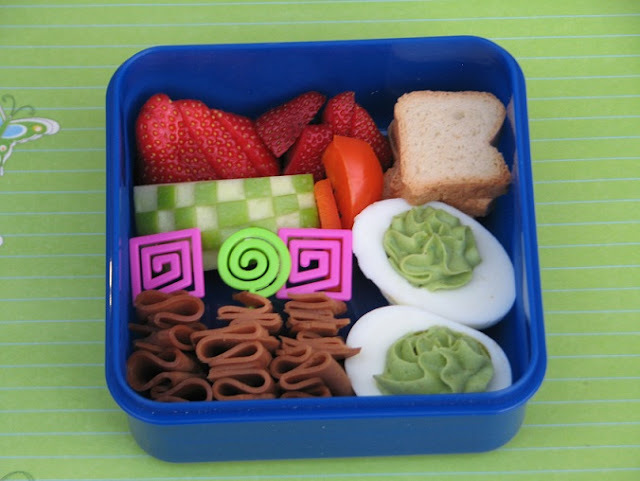 Head over to the awesome Rina's blog Bento School Lunches for another super cool Suess inspired lunch. Then follow the link on her blog and keep hopping with us! i love the green eggs. Everything looks so pretty and neat! My bentos never look like that.. even when i try! haha great job! So yummy and looks awesome! Love the mini toasts. This is so cute! I sent my kid off to school to buy hot lunch... but he was in a Sam I am Costume! (see pics on my blog).... We've finally been getting back to our more regular lunch packing this week after a month of sick mama resulting in lunchables, hot lunches, and lunches packed by the ten year old. Love your checkered apple and the green eggs! Cute lunch! Wow! Best green deviled eggs! Love the mini toasts! Love the delicate green eggs! how fun! I love the green deviled eggs!! That's such a great idea! The green eggs turned out perfect! !